You are currently browsing the tag archive for the ‘B2C marketplace’ tag. Alibaba ( HKSE 1688) must be as busy as bees, making sales calls to her clients on the heels of the latest announcement of a new entry-level Gold Supplier program slashing price to new users. The China internet company fleshed out a survival kit for SMEs with two major programs, bringing more sweetener to its paid members amid the global economy slowdown. Alibaba now offers full services to her existing “Gold Supplier” type paid members at US$5,000 per year. In a bid to strengthen its authentication and verification policy, Alibaba also disclosed that she has partnered with VerSign, a trusted provider of Internet Infrastructure services for the network world, to enforce her quality-control strategy. All paid members are expected to get passed the A&V process conducted by an independent third-party agency. It’s widely believed that Baidu‘s latest attempt to give a big push to her new C2C e-commerce platform, Youa.com will be taken as a threat. Renowned China search engine Baidu also beta tests BaiFuBao as her payment gateway. At this moment, Aliuser still cannot find any details on how this BaiFuBao will be functioned, what is the payment flow, fee structure and the cap on financed amounts. Joseph Tsai, Chief Financial Officer of Alibaba Group told Aliuser that his favorite colour was blue. Yet his heart was orange– Alibaba’s corporate color is “Orange” indeed!! The comments came after Aliuser got a chance to speak to Mr Tsai before the Mid-Autumn Festival. Mr Tsai also delved the group’s future strategy, focusing more on infrastructure and technology development. He noted that Alibaba group was rarely seen as a technology-related company now, but it was the corporate vision to get a top ranking in this respect. During the casual meeting, Mr Tsai explained that the merger of Taobao.com and Alimama.com would be ‘win-win’ for both parties. As Alimama’s online advertising model has lots of synergy with Taobao’s users and database profile, it could help Taobao’s shop owners to post and manage their advertising online. In response to the latest decision of blocking search engine Baidu indexing Taobao shops and products in China, Mr Tsai said Taobao has already established a reputation for C2C eCommerce, he expected users would come to Taobao.com directly but not through Baidu. Things are getting more interesting as Chinese portal Sohu.com, 51.com and Xiaonei have reportedly blocked Baidu from conducting searches of their sites. Anita Davis has more to tell in her report. Preceding experiences have told us that the relationship between eBay and Google has turned sour as they collided to each other in business development. Would history be repeated itself in the East? 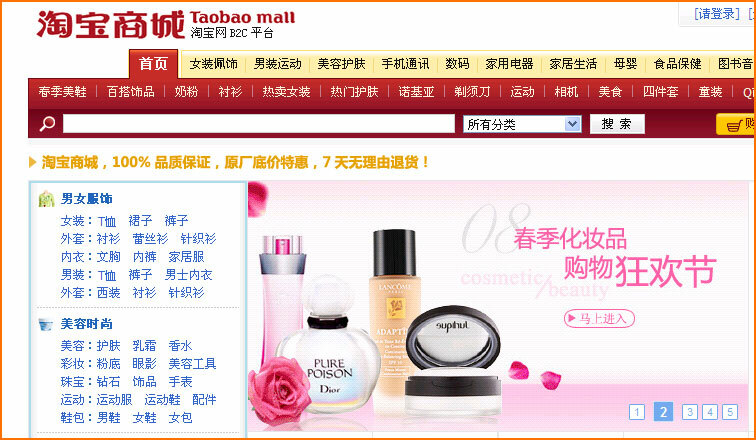 Taobao.com, despite displaying a beta “Taobao mall” next to its logo, is a fully functional web site that is going into its official launch very soon. Founded by Alibaba Group, the parent company of Alibaba.com, Taobao, positions herself as a C2C platform, facilitates transactions between individual consumers and a wide range of sellers. According to Taobao.com ‘s latest release with Alibaba.com’s Top 100 Global Buyers campaign, the C2C marketplace captures more than 75% the market share. Currently, Taobao.com has 53 million members, sales turnover hits US5.5 billion benchmark. Aliuser wishes you a Merry Christmas! !